That said, there is no such thing like a "final" design. Development always continues. Not only for your convenience, the extension board connector currently in the design stage will have the serial lines available, so you'll be able to plug in custom serial connectors. Timeout means, there is no connection at all. Possible errors include: wrong COM port, no juice (voltage supply) for the ATmega, a miswired connector, shorts on the board and cold solder junctions. Regarding shorts and cold joints, do you see both of them? Edited 1 time(s). Last edit at 12/11/2011 07:03AM by Traumflug. Is my USB-ttl connection ok? Well done for the bridge, cold joints are all in the upper row as well. I ve read it many times but I dont understand what to do with CTS. Should I connect it on pin2 or leave it disconected. And for firmware problem. The led lights up (atmega has power), com port is ok, all voltage on gen7 plate is ok, baud rate is 115200. Is anything wrong with settings on picture? Hmm. Which USB-TTL connector are you talking about, after all? "Pin 2" isn't really helpful, as different devices have different signals on this pin. Also, what makes you think there's a bootloader on the ATmega? If you have a programmer, upload a firmware with the programmer, bypassing the bootloader. A Firmware sending some serial stuff at 9600 baud, like this one: [github.com] This will send a signal on ATmega's TxD, which should be received by your converter's RxD. Just two pins, TxD and GND, no further signals. If you have the ATmega from me or Paoparts, this firmware is uploaded already, along with the bootloader. With one pin working, you can identify the other TxD/RxD pair (opposite direction). Three pins are sufficient for full communications in both directions. Like shown for the E'go adapter, shown on the same wiki page. 5V is obsolete, unless you want to drive the ATmega from USB. If you don't have the converter's RTS connected to the Reset line, you have to reset the ATmega manually. Hit the reset button just before or just after Arduino IDE reports the size of your firmware when attempting to upload. Opinions vary on the exact timing, so experiment a bit. No no I talk about pin2 on the gen7 board. Should I connect CTS from USB-TTL connector to pin 2 on gen7 or should I leave it disconected. Becouse pin1 and pin2 on gen7 are both GND. Sorry for bad englis, hope you uderstand what I mean. Should I connect CTS from USB-TTL connector to pin 2 on gen7 or should I leave it disconected. This matters if you configure your serial port for hardware handshake, only. See "Flow control" in the left of the two windows in the picture you posted above. Hardware handshake on the PC side and auto-reset on the ATmega side don't play well together, so everybody is using no handshake. This cable looks pretty much like it works without changing anything at all. 2) Tool temp sensor reads 0 while the PSU is on. If I disconnect the ATX 20-pin and jumper for molex only (forcing the ATX PSU on with a jumper AND still using a fan to prevent sleep state, the tool temp works just fine. Any suggestions before I replace this scum-bag PSU? Otherwise everything works fine so far.... other then scratching my head for an hour until I turned up the pots on the stepper drivers. Many PSUs do this, it's allowed in in the ATX power supply specification. The load should be connected to a 5V rail. Here's probably not the PSU at fault. Sounds like a bad solder point or interrupted track or something. A voltage meter should find out more. A big Thank You to Bryanandamiee! I'm finally getting around to finishing a gen7 version 1.2 board, and I just connected the power to check the voltages (Using only 4 pin molex connecter, jumper is correctly set). When I turned my power supply on, every led on the board lit up. I have the 3 MOSFETS soldered in, but the ATmega is not in place. I'm wondering if those 3 LEDs next to the MOSFETS should be on. The other two are as they should be. With the atmega removed the gates of the FETs will float so that is likely what you would expect from that configuration. For the near future (Repetier firmware V 0.41) if you want Repetier firmware to do PWM heater control on Gen7 you'll need to refer to this post. Or you can just turn off PWM and do on/off control, but temps are far more stable with PWM. Changes will go into the next revision and then you won't have to change code to get it to work. Any chance we will see an SD card extension added to Gen7 in the near future? Uploaded the 'test code' as explained on the wiki.. and yes i can see my psu starting up and my led of the psi turn on .. Then i see the heater Leds on and off.. Opened up the terminal to see the comms.. all ok ..
to verify if I am not locked in a preloaded firmware i changed the code slightly to confirm it is 'my' code running :-) and it still gives me the all clear sign..
Then I uploaded the firmware of repeater.. (already have it running on a ramps board.. ) I cannot get connected in any host.. repeater/pronterface.. Checked the baud rates etc..
Then I tried the fiveD gen 7 as mentioned on the wiki.. but also there I cannot get the host connected..
PSU is switched on but asleep and waiting for things to happen..
Edited 1 time(s). Last edit at 01/03/2012 05:25PM by mhensen. @mhensen, you have to make sure you compile your firmware for the right clock frequency. Firmware default is usually 16 MHz, many Gen7s run 20 MHz. With the wrong clock frequency, baud rate will be wrong as well. @metzench, have a look for the work of Alfons3 on Github. Thanks for the hint, looks interesting. Any plans to merge this sometime? I rechecked and reinstalled the software for the arduino .. but I cannot get it to communicate between the rewrap software and the board. I traced all the lines with a knife to make sure no solders were touching .. I can confirm it is atmega 644 + 20mhz crystal ... (your own package :-) ) and I can upload firmwares without any problems .. confirmed the drivers are running on the correct speed.. but do I have to check the firmware code is elf for the 16MHZ or is this done by the board selection of the compile and upload? Well I have been busy looking at makefiles .. looking at comm port settings .. try and get any response from the atmega but for now it only seems to accept the firmware and do nothing at all.. I don;t know where to look for next .. I have updated all the drivers, switched OS.. but no luck so far.. Soldering the smd's on the ramps seemed easier then all trouble I am having now.. Please if somebody has any suggestion?! Idea's to check.. I have checked all solders.. and beeped them to check for shortcuts.. so far nothing is wrong on the board..
Just a guess .. if the test firmware with the power on and off of the less en psi runs and communicates back what could be wrong.. the crystal ?! Fow now I am completely lost...please help :-) I did numerous uploads of firmware.. from repeater/sprinter to the test version. opened up the hosts of repetier and pronterface..
rebooted the PC from win 7 to win xp.. nothing.. Only the test firmware is the one that keeps working when I upload that one.. so I have a serial connection.. otherwise I should;t be able to upload... after every reset .. power en PSU and blink the 2 leds.. turn of PSU and in sleep mode..
tried if via the arduino desktop tool and via avrdude command shell.. But I am still able to change and upload the test PDE .. even change and reupload and I can identify it is another program! ???????????!??? Running (trying to run Gen 7 with atmega 644 20mhz.. ..
Edited 7 time(s). Last edit at 01/05/2012 08:06AM by mhensen. Any plans to merge [Alfons3's enhancements] sometime? Sometime. You know, since the PrintrBot story it's clear one has to make complete machines and beefing up details isn't honored. OK, perhaps a bit exaggerating, but things are goiung this direction. Sometimes it's really tricky. You know, the guy with the board in the picture a few posts above stared at his work for weeks and couldn't find it. After he finally sent it to me, it took me less than a minute. Not because I'm brighter than him, but because ... well, I don't know. The unfortunate thing is, such things can't be seen remotely. I'm glad you finally found the issue. Thanks very much for all your hard work designing this board. I've just successfully finished printing and etching a board using Press-N-Peel paper. The hardest part was the ironing. Took six trys to get the iron temperature just right. Oh, that's a snapshot of the current development. Does it work? I reviewed your changes in the github repository and they all seemed reasonable, so I decided to use the latest. It passed the smoke test. I've successfully uploaded the boot loader and then ran into a problem. When I try to build a SetupTest I get errors that 'Serial' and 'delay' were not declared in this scope. I get similar errors if I try to write a simple sketch. I've installed the Gen7 Arduino files into the proper location. The four Gen7 boards show up in the Arduino menu. 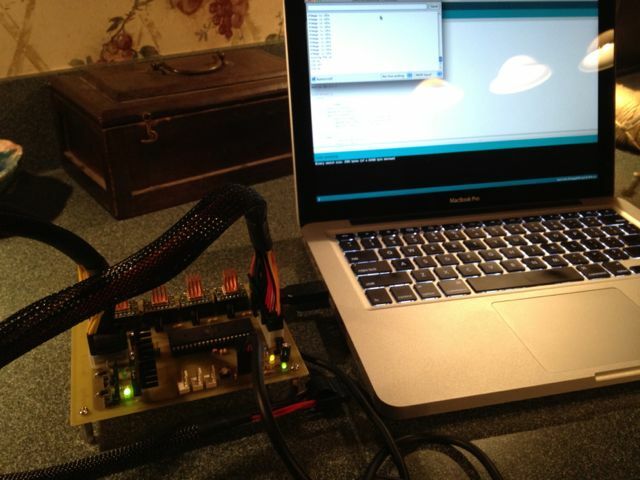 I'm running Arduino 1.0 under OS X 10.7.2 if that matters. I've got an Ubuntu VM just in case I need it. It was late by the time I ran into this so I didn't really try too hard to solve. I'll have a look at it again tonight. I have plastic parts for a Sells Mendel. I'm still waiting on hardware. In the meantime I was going to write some more small test sketches that exercise each of the different functionality. BTW, I've read the 'PCB Milling' topic. Its unclear what machine you ended using to mill your boards. Are you using a WolfStrap or some other machine? Ok. My problem appears to be due to Arduino 1.0. Your Gen7 dist contains "WProgram.h". Arduino 1.0 now expects "Arduino.h". I worked around this easily by just adding "Gen7/cores/arduino/Arduino.h" that contained the single line '#include "WProgram.h"'. I think if you add this one file it will work for anyone with Arduino 018 or higher, including 1.0. I uploaded SetupTest to the board. PSU came on. Heater light blinked. PSU went off. I'd say it works. While I'm waiting for the rest of my hardware I'm going to write some small sketches to test the endstops, both heaters, temp inputs, and steppers. I'll post them in case anyone is interested. Its unclear what machine you ended using to mill your boards. Are you using a WolfStrap or some other machine? Yes, it's a WolfStrap. Carefully adjusted, it works quite reasonably. See the "Gen7 Stories" Wiki page. > Ok. My problem appears to be due to Arduino 1.0. > Arduino 018 or higher, including 1.0. Yes, but I'm not sure that will work with some of the other firmware out there. Some of it seems quite picky. > endstops, both heaters, temp inputs, and steppers. > I'll post them in case anyone is interested. I'd like to see this when you're finished. Printrun/pronterface is a good test for some of this, but as I worked my way up to running Teacup/Pronterface, it would have been nice to have some more sanity checks. For example, I had a short on my one of my motor drivers that did not turn up until the driver code tried to enable the motors. I found it by adding debug code to find out where the reset occurred. But I was thinking it would have been nice to have some software that said "About to enable motor control on pin Axx" just beforehand so I could see where it reset. In fact, I think it could even notice the brownout condition and report the last thing it tried (from eeprom?) with the right timings. I'm not sure how useful it would be once you get "out of the gate", though. I have my Gen7 board built and working now (Thanks, Markus!). But I haven't printed anything yet. This week I added a heatbed similar to Adrian's heated bed. It works pretty well. Last night I watched it get right up to 100C and rest there like it was supposed to. But then I noticed something funny. The two black heat sinks on my MOSFETs were no longer black. Now one was black and the other was copper colored -- bare metal. 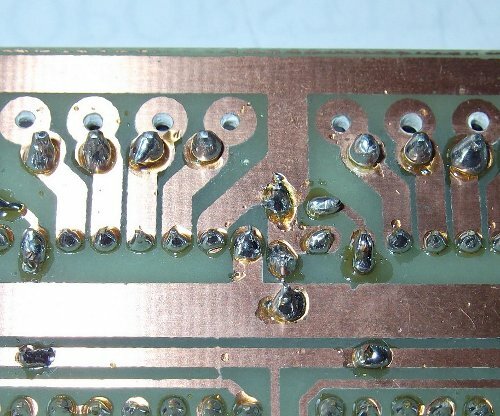 The heat from the MOSFET vaporized the paint. Also, the MOSFET is now sporting a hole and an "always-on" feature. I replaced the bad MOSFET with another one I happened to have around along with a massively oversized heat sink and some thermal paste. This heat sink still overheats, though, so I also had to add a fan. I'm wondering about this failure, of course. I almost replaced the thing with a relay, but I couldn't find a suitable one in my parts drawer. But a relay might be much more suitable here. Or maybe I should have used Adrian's schematic and placed a secondary MOSFET controller on the heat bed itself. At least then the bed-as-a-heat-sink would be a good use for the waste heat. Since I am driving my extruder hot end directly with the other MOSFET, I didn't think I needed 2nd stage transistor for this heat bed. Was I overreaching? My current theories are that the MOSFET overheated (overheats still) because the PWM is too fast for it and causes it to waste too much time switching (inefficient). I don't grok transistor datasheets too well, but this IRFZ44N looks like it should be able to handle the switching load. But it also says that it will dissipate 75W(! ), which seems like a lot to me. 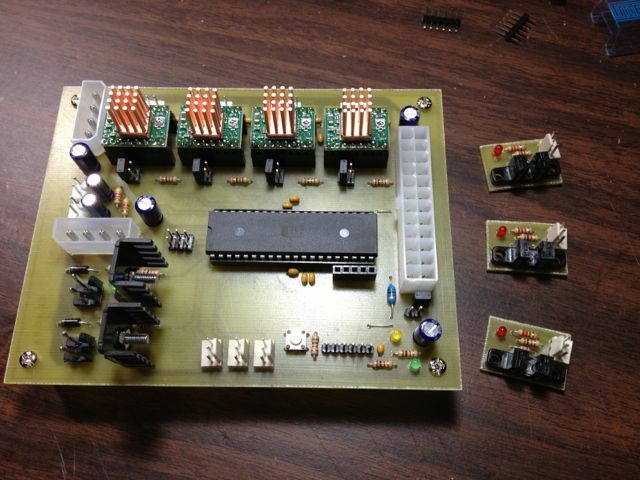 I'm planning to go experiment with the PWM and see if I can tone this down a bit. After all, a heat bed doesn't need such fine tuned (PID) control, I would think, since the thermal mass is so huge. Any advice or commiseration is welcome.